Spring Weather = plenty of Hand Stitching Time in the yard while the kids play. 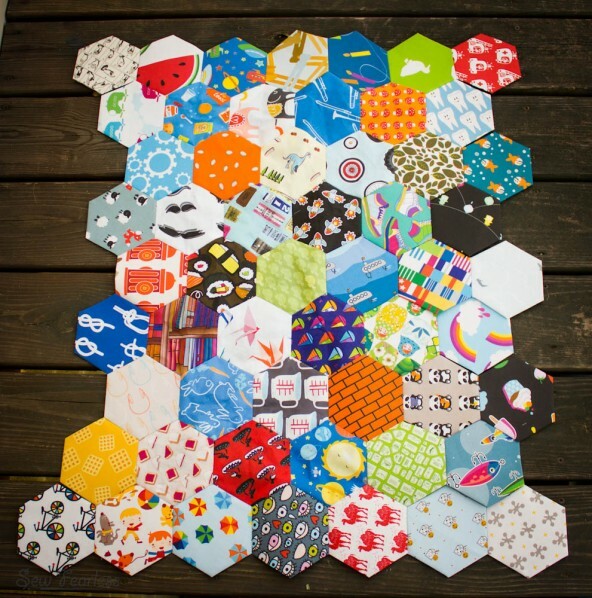 So much time, in fact, that I have all 56 hexagons attached to the quilt (some are not sewn all the way on yet). It certainly went faster than expected. I think it needs just three more hexagons on the left side to balance it out properly. I tried out some new things while putting together my Hexy Kit and working on this project. I tried these because of the talented Katy’s recommendations and they worked so well, I wanted to pass it on. Grey thread blends far better than white or ivory on this eclectically colored quilt. Beeswax * – Running the thread through the beeswax does help it not tangle quite as badly. It’s not perfect, but it seems to do a little better. Now that I have gotten to this point, I am wondering how I will finish off this quilt. I have two ideas. Applique it to a solid blue background then finish it off like a regular quilt (quilting, binding). 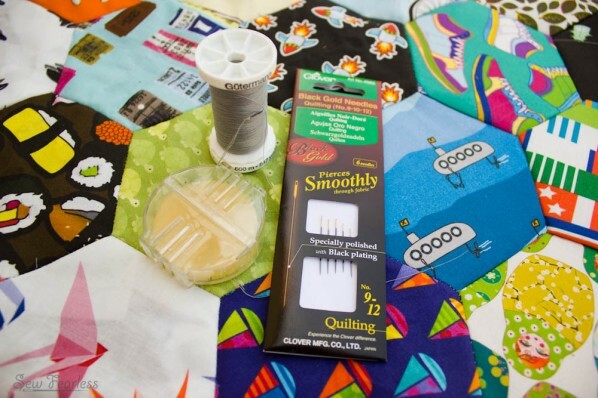 Add solid blue hexagons (in various shades) around the edge of the quilt for a sort of border. Then, figure out how to keep the edge hexagon shaped. What say you? 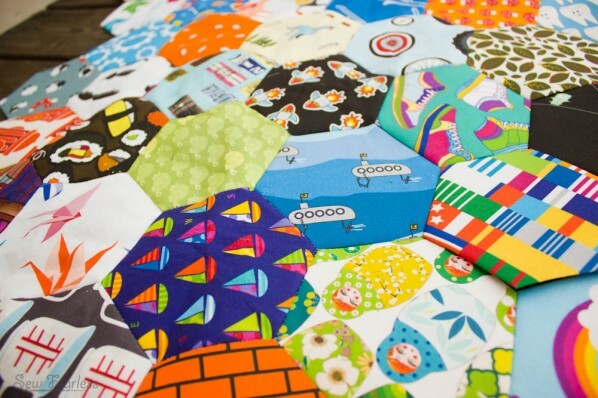 How would you finish this quilt? 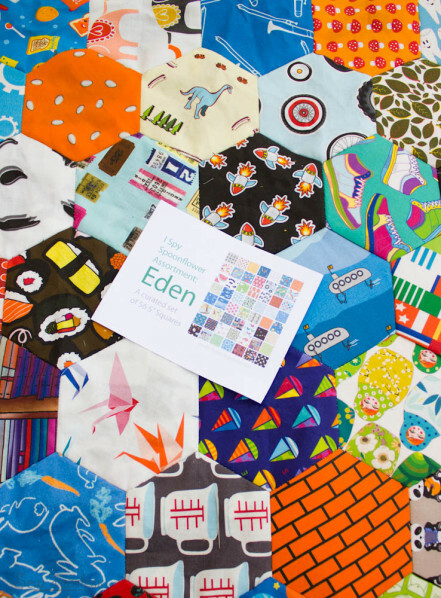 « Mommy Poppins Bag Pattern Winners! It’s coming along really well! 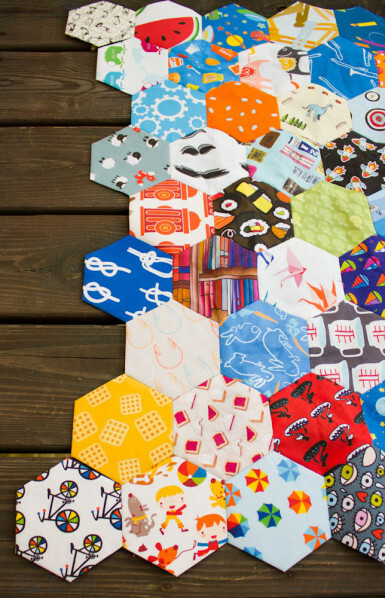 I’m not a quilt-maker, but I think I would go for the hexagons in various shades of blue for the border. I couldn’t tell you how to finish it, but I can tell you it looks awesome. And it may be yet ANOTHER sew fearless project that I have to copy.